Register now for MARP’s 2018 Annual Meeting! Make plans now to attend! 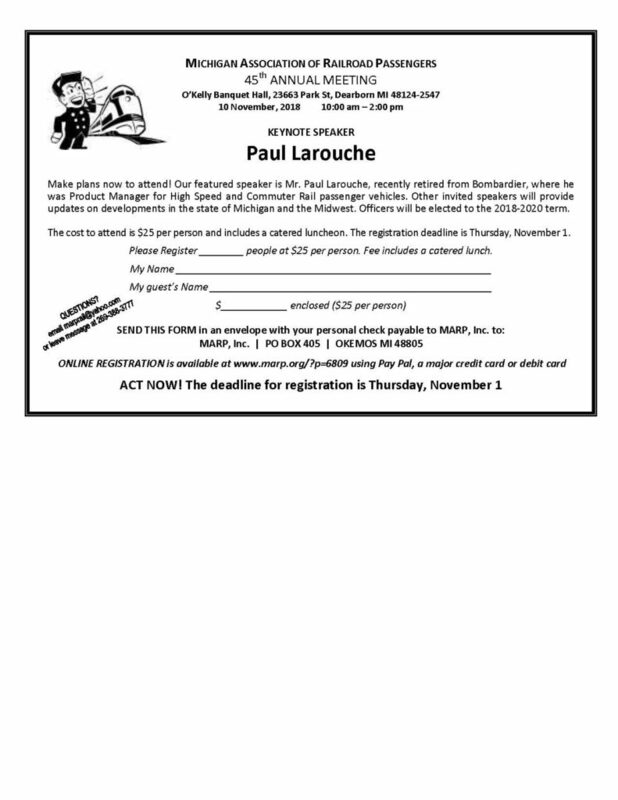 Our featured speaker is Mr. Paul Larouche, recently retired from Bombardier, where he was Product Manager for High Speed and Commuter Rail passenger vehicles. Other invited speakers will provide updates on developments in the state of Michigan and the Midwest. Officers will be elected for the 2018-2020 term. The cost to attend is $25 per person and includes a catered luncheon. The registration deadline is Thursday, Nov. 1, 2018. DEADLINE: Thursday, Nov. 1, 2018 is the deadline for registrations. ACT NOW! The deadline for registration is Thursday, Nov. 1, 2018. MARP Annual Mtg 2018 – web registration form.